Thanks to Ruthie Baudoin for info and photos from this location, the latest outpost of the venerable Ace Hotel franchise. 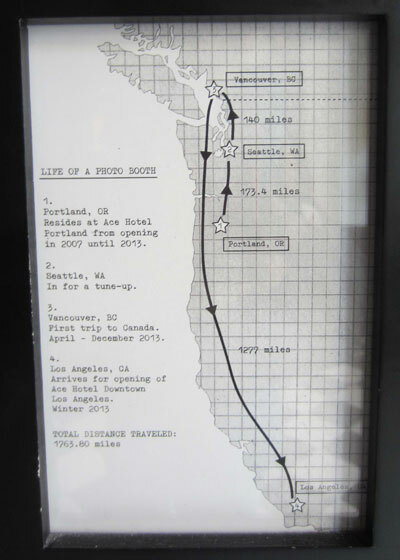 This booth ($5 per strip) was previously located at the Ace's Portland location; it even hosts a sign titled "Life of a Photobooth," describing its voyage from Portland (via Vancouver) to Los Angeles. UPDATE 12/20/16: Andrew reports that the booth is in good working order. UPDATE 7/12/18: Shan let us know that the booth here is still going strong, now $6.45 per strip via credit card.